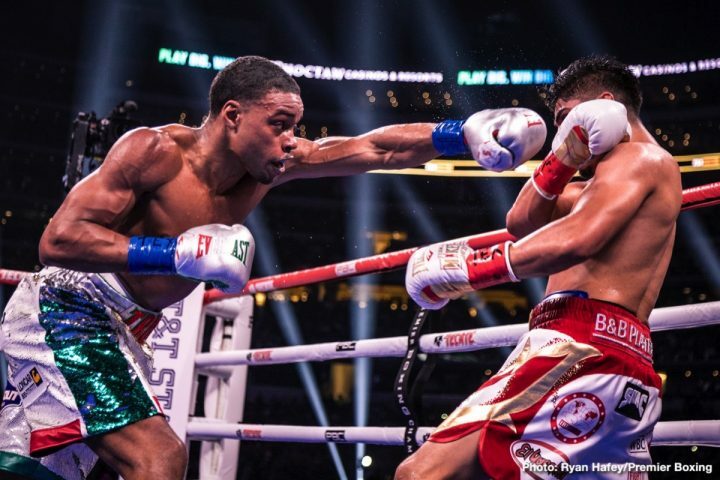 Errol Spence: "I'm going back to bulldozing opponents"
By Chris Williams: Errol Spence Jr. (25-0, 21 KOs) was doing some gloating after beating Mikey Garcia (39-1, 30 KO) last Saturday night by 12 round unanimous decision in their pay-per-view fight on Fox Sports. Spence Jr. says the critics told him that he didn’t possess the ring IQ to beat Garcia, and he feels that he proved them wrong by out-boxing him over 12 rounds. Spence says now that he showed that he can box his way to a decision, he’s going to go back to “bulldozing” his opponents like he’d always done in the past in going out there and looking to score quick knockouts. Spence says it’s boring to use ring IQ to win fights. He prefers to shoot for fast knockouts. After receiving a lot of criticism in the build up to the fight, Spence made it a point to go out and prove to his critics that he could dominate Mikey by boxing him, as we saw him do in winning all 12 rounds by the scores 120-107, 120-108 and 120-108. “They say I ain’t got no jab. I can’t move my head. I wasn’t smart enough. Didn’t have boxing IQ,” Spence said to Fighthype. “I’m going to go back to bulldozing. Forget the boxing IQ. That stuff is boring. They said I can’t box,” Spence said. The way that Spence was fighting against Mikey, it looked unnatural for him, as he appeared to make his job a lot harder than it would have been had he bulldozed Garcia from the first round instead of waiting until the ninth. You can’t say that Spence was fully bulldozing Mikey from rounds 9 to 12, being that he was still boxing him a lot and not going all out looking for a knockout the way we’d seen him do against Chris Algieri and Carlos Ocampo. Had Spence fought like that against Mikey, he probably would have stopped him in the first six rounds. Even if Mikey had chosen to be stubborn by refusing to quit, his trainer Robert Garcia or the referee would have had to stop the fight. They wouldn’t have let Mikey soak up punishment against a fresh and highly aggressive Spence in the early rounds. Spence waited far too long in choosing to start fighting aggressively in the 9th round on rather than from the start of the fight. Spence started to throw more heavy shots beginning in the fifth, but he still didn’t begin to put a lot of pressure on Garcia until the ninth round. The ninth was the best round of the fight by Spence by a long shot. Spence looked like he was on cruise control in the ninth round. However, in the 10th, 11th and 12th, Spence appeared to be thinking too much and not throwing his shots the way he needed to for him to have a shot at knocking Mikey out. Spence would pause before attacking, and that pause would allow Mikey to time him and nail him with a hard shot. Spence then stopped attacking as hard like he’d done in the ninth. If anything, Spence showed poor ring IQ in not continuing to bulldoze Mikey in rounds 10, 11 and 12 like he’d done in the ninth round. Did Spence’s decision to box Mikey rather than bulldoze him hurt his chances of winning over new fans? Spence might have blown a great opportunity for him to win over a lot of new boxing fans by failing to try and smash Mikey from the first round. With the fans that had ordered the fight on FOX Sports PPV, Spence blew his chance to make those casual boxing fans want to see him fight again. What Spence might not have realized is how the perception of him, the much bigger and stronger fighter, would look in the eyes of the boxing fans in watching him fight like he was afraid of the smaller Garcia. It was a monstrous mistake on Spence’s part. If it was Spence’s trainer that came up with the idea of him boxing Mikey through the first eight rounds, then that was a mistake. Spence might want to find another trainer that makes sure he fights in an exciting manner, and understands HOW he needs to fight for him to win over new fans. Boxing from the outside the way Spence did against Mikey isn’t the way to build a fan base. That’s the way you put the fans to sleep, and make them not to want to see him fight again. When those fans hear that Spence is going to fight next, you can bet that a lot of them won’t want to pay their hard-earned money to watch him box for another 12 rounds in a boring fight. Spence, 29, is going to get his chance to show that he can bulldoze his next opponent Manny Pacquiao, because the former eight division world champion agreed to fight him next. Spence wants that fight, and it could take place in July. “He’s broken records here before, he’s a legend in the sport and it’d be my honor to fight him next,” said Spence about Manny Pacquiao. Pacquiao didn’t waste time in quickly agreeing to fight Spence. Spence might have up wound scaring off Manny Pacquiao, as well as the other top welterweights, if he had bulldozed Mikey, but it would have been worth it. Spence is already being avoided by the top welterweights with him bulldozing Carlos Ocampo, Lamont Peterson, Kell Brook and Chris Algieri. If Spence had done the same thing to Mikey, who knows what Manny would have done. Perhaps he would have chosen not to climb inside the ring to have Spence call him out. Never the less, Spence can’t be listening to his critics when they say he can’t box, move his head or he doesn’t have a ring IQ. By listening to those guys, Spence changed the way he fights to please them. In doing so, he upset a lot fans, who felt his fight with Mikey was as boring as watching paint dry in the afternoon sun. Spence has to know that what the U.S boxing fans pay to see is exciting fights that are filled with drama, and end in a knockout. The fans don’t want to pay to see a fighter run around the ring, jabbing and fighting defensively against a smaller opponent, who is moving up 2 weight divisions to fight them. Spence needs to stick with what got him this far in his career as a pro by continuing to apply pressure against his opponents to try and knock them out. That style is popular, and there are only a handful of fighters that can do it. Gennady Golovkin is one of them, but he’s getting up there in age at 36, and there’s going to be an opening to fill when he retires from boxing in the future. Saul Canelo Alvarez fights more like Floyd Mayweather Jr. than Golovkin, so he’s not going to become popular with the boxing fans that like to see nonstop action. Spence has the best chance to be the replacement for Golovkin and become a big star, as long as he doesn’t listen to his critics and try and box his opponents.